"Goes awesome with baked beans and browned sausage." Jacobi’s Premium Sauces started years ago in Mom’s kitchen. Known as "Naomi" to her friends and family, she didn’t like the smoky and spicy flavors of most sauces. So, like any good country cook, she just made her own. Mom served the sauce for years at our many family suppers. Growing up in a small Midwestern community, every night we had a country fresh supper, together as a family. We always looked forward to it and sometimes started preparing for it hours in advance. Many times supper included a dish right out of Dad’s garden. We took the sauce for granted though. We thought everybody made their own sauce the same way we made our sweet tea. Throughout the years at the many family picnics and pitch-ins the sauce became known as the “family recipe”. We’re not sure how long it took Mom to get the recipe perfected, but we know that she did. We also knew the sauce was something special. About 40 years later in 2005, my wife Lisa and I launched the family business known today as Jacobi’s Premium Sauces. We wanted to bring the taste we’ve known and loved for years to our friends – both new and old. 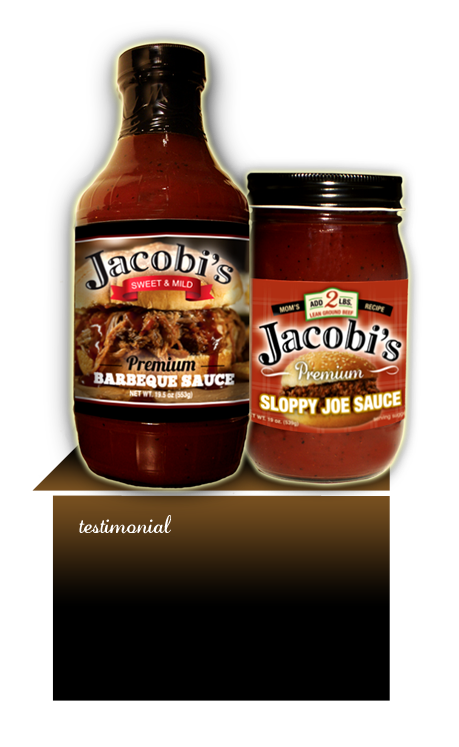 Enjoy a Jacobi’s Premium Sauce today and we think you’ll agree that it is something special and Mom got it “just right”.